Muffin Tin Monday didn't go so well this week. 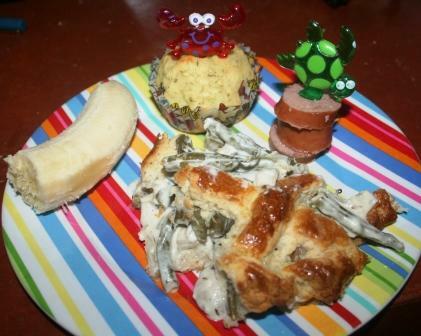 I pushed it too far with the green bean pie - he just doesn't like it (although he did pick out the mushrooms to eat). So anyhow, this compilation - a banana, a zucchini dill muffin, turkey kielbasa, and green bean mushroom pie was not a popular lunch. Not at all. I heard a lot of "I don't like this!". He shouldn't complain, right? At least his banana wasn't mad this week! Plus, he got totally cute summer picks that JDaniel4sMom gave me. And there are starving children in.....okay, okay, better luck next week, right? For more infinitely more appetizing lunch ideas for kids, check out Muffin Tin Mom. It looks great to me. The starving mom in Greenville that is reading this before breakfast would eat it right now. At least he told you he didn't like it instead of just stuffing it under his chair or some other place,lol! It looks good to me! Those picks are super cute!!! I would eat that pie Lisa! At least it looks cute! Ha hey I think it's impressive that he pickd out the mushrooms. Not a lot of kids like them. Mmm . . . that all sounds fabulous to me! Hi there (I'm Regina from Kilauea P)..your pie below looks fantastic and bet was delicious! So he picked the mushrooms out to eat (lol)..lovely family and your profile discription of life sounds ideal! I cannot wait until my babies can participate in Muffin Tin Monday! I am starting to gather ideas now! I think it looks pretty good. However, even my older kids wouldn't eat the pie....but I would!